Derivation of Name: Melaleuca...from Greek melas; black and leukos; white, referring to black marks on the white trunks of some species due to fire. quinquenervia...from Latin quinque, 5 and nervus, a nerve, referring to the pattern of veins on the leaves. 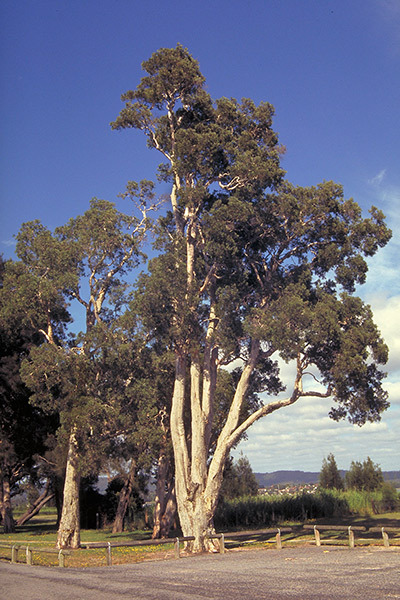 Melaleuca quinquenervia is probably the most familiar of the "paperbarks" in eastern Australia. It is a very common species along coastal streams and swamps and is widely cultivated. It is a small to medium-sized tree which can reach 25 metres but is usually up to 12 metres in cultivation. The bark is persistent and develops a multi-layered papery habit. The bark can be easily peeled off in sheets and this has been used as lining for hanging baskets. It is not a practice that should be encouraged. The leaves are flat and leathery, about 70 mm x 20 mm with 5 distinctive longitudinal veins. Flowers appear as short bottlebrush spikes, creamy white in colour and 50 mm long. Main flowering is in autumn. A red-flowered form has been reported to be in cultivation. The fine seeds are enclosed in woody capsules arranged cylindically around the stems. Although M.quinquenervia is suitable for many areas in Australia, caution should be exercised in planting the species in tropical wetland areas overseas. The plant has caused serious environmental damage in the Florida Everglades, USA, where it has spread uncontrollably. M.quinquenervia is hardy in a range of climates and is particularly useful for poorly drained sites. It is an attractive tree which is very useful for landscaping. The white, papery trunk is particularly appealing. Birds are attracted to the nectar in the flowers. Propagation is easy from both seed and cuttings. Particular forms must be propagated from cuttings to ensure that plants true to the parent are obtained.